Posing with friend and inspiring educator, Nicolette James, and her amazing Intentional Educator Planner. I consider myself a reflective teacher and I consider myself a writer. Interestingly enough, my lesson planbook has never quite been a place where I show either of those aspects of myself. Quick jots and page numbers are what you might find by looking in my planbook. But what if there was a way to build in opportunities to reflect, in writing, about my teaching right in the place where the lesson plans reside? And what if that place could also offer daily inspiration and opportunities to set positive intentions for the week ahead? 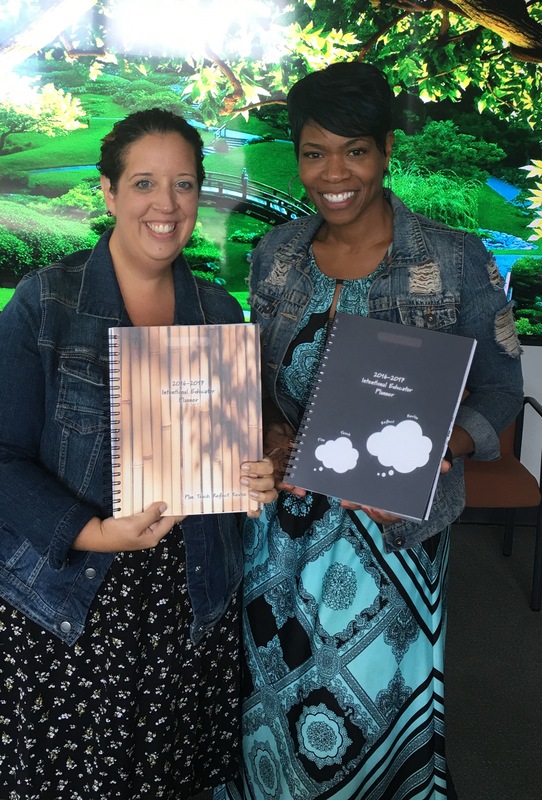 All summer, through the magic of Voxer, Nicolette and I spoke about our dreams and goals for the upcoming year, as well as this exciting venture of publishing her new 2016-2017 Intentional Educator Planner. On Saturday, at the Long Island Writing Project, Nicolette gifted me with my very own Intentional Educator Planner. While designed for teachers with 5 preps or 5 subjects to teach, there are 5 boxes in which to write each day. As an elementary teacher, I need 6 boxes each day, so I am going to adapt this planner to reflect my literacy instruction and keep track of my small group lessons. I am excited to use the weekly reflective prompts. Each week offers the opportunity to use writing to set an intention, think about what I am grateful for, note what I am looking forward to and what I learned. What will be the impact of this type of reflective and intentional thinking sharing the same space as my lesson plans? I envision and hope that by putting these reflections and goals in writing, I will be inspired to create richer, more meaningful lessons. 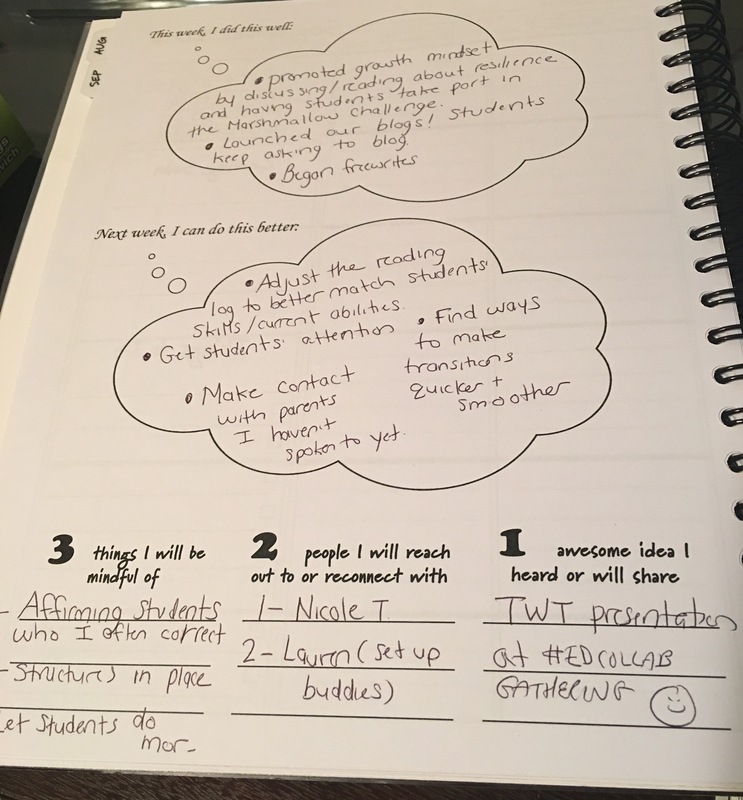 A page of my reflections from my new Intentional Educator Planner, created by Nicolette James. Participants reflected in writing on this quote and what it means to us. I thought about the things I fail to notice. I’ve found myself recently stopping to look at the sky and realize I often don’t notice the beauty of the world around me in my hustle and bustle, go-go-go approach to the day. I thought about my students- 24 third graders- and do I always notice each of them? After we shared our thoughts around this quote, Nicolette asked us to consider what “mindfulness” means to each of us. We then engaged in a meditation where we listened for the sound of a bell and tried to attach one of our worries to the bell, sending the worry off as the bell got lower and lower. Next, Nicolette gave us a series of prompts to respond to in writing. 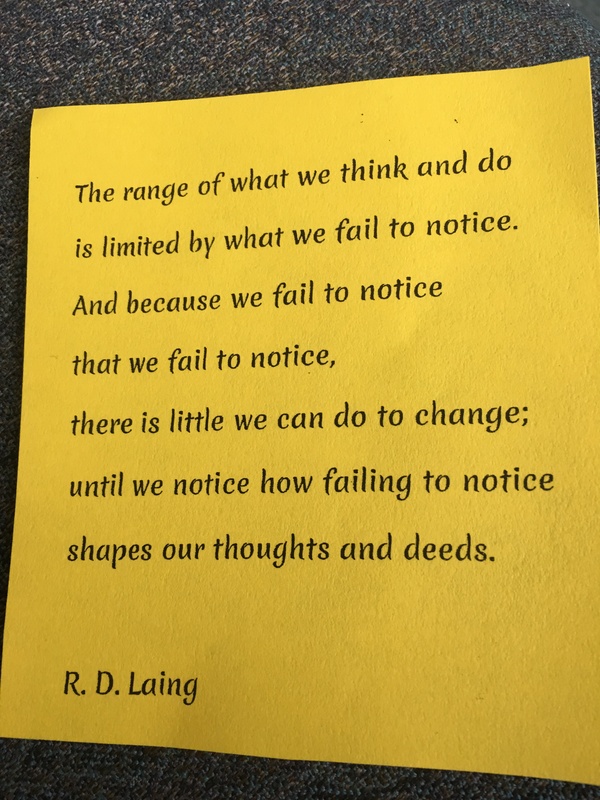 Connecting to the quote, she asked us to consider what we might be failing to notice professionally, socially, personally, financially, and in regards to our health. We spent some time writing about each of those areas. Then, Nicolette had us stand up in “concentric circles.” The group split in half, with some of us faced outwards, and the other participants each stood in front of us, forming an outside circle. We shared one category that we just wrote about, before the outer circle rotated to the next person. Thus, you shared all of your ideas with several different people. I had so many rich conversations! After thinking through all these aspects of ourselves, Nicolette asked us to consider this school year and write, “What will you start doing? What will you stop doing?” From there, she discussed the idea of setting an intention and then creating a goal. Your intention is the vision you are working towards and the goal is the actionable steps for how you can get there. This was one of my intentions- to be more organized with my materials in order to have the space to meet with small groups. My goal, then, is to clear off my u-shaped table each day to keep the surface clean and accessible for small group meetings. This workshop reminded me of the power that comes when you slow down, take the time to reflect, and select goals that will move you forward. Writing is a tool that we can use to reflect and be more intentional about all we do. The Intentional Educator Planner is a fantastic way to build in weekly reflection and goal setting. How do you use writing to reflect on your teaching and set intentions for your professional practice? Continue the conversation in the comments! Kathleen, this was a great reflective post. Writing matters and reflection helps us refine our writing. Well done! I set up a personal blog in order to do more reflection in my practice. I am still figuring out ways to make it meaningful and efficient, but it has been really helpful so far.